Throughout history, diamonds have held an incomparable sway over the human imagination, inspiring passion, obsession, and lethal greed. 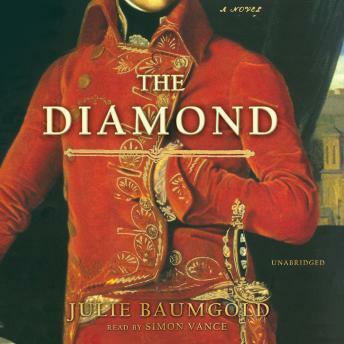 Julie Baumgold's The Diamond brings to life the amazing story of The Regent diamond and the colorful, powerful figures who have owned and coveted it. Baumgold's brilliant and ambitions framing device sets the exiled Napoleon and his biographer Las Cases as the narrators of the story. Discovered in Madras, India, by a slave (subsequently murdered for his good fortune) and brought to England by an ex-pirate named Thomas Pitt, The Regent begins its journey through the decadent courts of Europe. Thomas Pitt sells the stone to Louis XIV's profligate brother, The Duke d'Orleans, and it is worn in turn by Louis XIV, Louis XV, and Marie Antoinette. The Regent is stolen during the Revolution and found in an attic, only to be pawned by Napoleon for the horses that ensure his first victories. Napoleon eventually recovers the gem and has it placed in his sword believing it to be his good luck charm-yet his fall is brought about by William Pitt the Younger, a descendent of the very man who bought The Regent a century before. Conceived and executed with verve by Baumgold-herself the daughter of a diamond merchant-The Diamond is a thoroughly engaging page-turner, rife with fascinating episodes all the more astonishing for being based in fact.